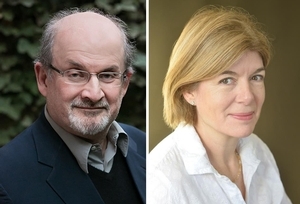 Thu, September 28, 2017 7:30 P.M.
“A master of perpetual storytelling” (The New Yorker), Salman Rushdie is the author of a dozen novels, including Shame, The Satanic Verses, and Midnight’s Children, winner of the Booker Prize in 1981 and the “Booker of Bookers” Prize in 1993. His other works include a short story collection, East, West, and four works of nonfiction, including the memoir Joseph Anton, which chronicles his time in hiding during the Ayatollah Khomeini’s fatwa calling for his death. Rushdie’s latest novel finds an enigmatic billionaire taking up residence in an exclusive Greenwich Village enclave. “Adept at evoking complex psychological territory” (The New Yorker), Claire Messud is the author of The Emperor’s Children, a cutting portrait of life among Manhattan’s junior intelligentsia that was long-listed for the Booker Prize. She is a PEN/Faulkner Award finalist and a recipient of Guggenheim and Radcliffe fellowships, and her work has been thrice counted among the New York Times Notable Books of the Year. Her other novels include When the World Was Steady, The Hunters, The Last Life, and The Woman Upstairs. In The Burning Girl, Messud tells of two inseparable friends who find their bond tested by adolescence.